After a couple weeks of decompression from Vegas, I’ve had a few sleepless nights to think about what I learned (remembered?) from my trip. It seemed that calls for branding were even louder than last year. As I listened to said calls, I looked around the room to gauge reactions. Some people nodded in approval, while others looked at each other with a quizzical look on their face, while others mindlessly tapped away on their iPhones. 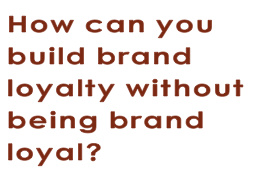 Over the years I’ve had many great discussions regarding branding strategy (When Business People Go Wild, I know). I went on a bit of a tirade on the subject last year, and it looks like it’s time for another one. It’s pretty clear that branding needs to be empirical. If you can’t touch it, feel it, smell it, taste it, then you can’t pass those senses along to potential clients. Defining a brand is hard, which is probably why so few companies do it well (I’m going to go a little academic on you, so consider yourself warned). Webster’s has a few definitions for brand: a mark made by burning with a hot iron to attest manufacture or quality or to designate ownership; a printed mark made for similar purposes (trademark); a class of goods identified by name as the product of a single firm or manufacturer (make). Our oft quoted pal Seth Godin goes further, stating: “A brand is the set of expectations, memories, stories and relationships that, taken together, account for a consumer’s decision to choose one product or service over another. If the consumer (whether it’s a business, a buyer, a voter or a donor) doesn’t pay a premium, make a selection or spread the word, then no brand value exists for that consumer.” In his newest book, “the End of Business as Usual,” Brian Solis came up with 9 Criteria for Establishing Brand Essence: Focus, Feeling, Individuality, Experiential, Consistency, Credibility, Longevity, Personal, and Portable. If you stayed awake long enough to read these different definitions you probably realize that it’s safer to take the 30,000 foot view. How do your choices/products make you feel? What memories do you have associated with them? Where are you consuming it? If you have the choice, why are you buying it there? Do you feel a twinge of guilt when you do not go with your picks? Do you get a feeling of disappointment when something changes? Do you feel the need to share with someone at the company when your expectations aren’t being meant? Who are you buying it from? Do you ever go with the cheaper option? If you can’t possibly answer these questions on a regular basis, it’s time to start. Let’s face it: these are gut-questions. These are also the same questions your customers have about you, as well as the products and services you sell. As consumer-facing automotive sites continue to consolidate, and the reliance on social media becomes stronger, the amount of differing opinions will continue to shrink. You need to understand the fundamentals of branding before it’s too late. Learning what it takes to exude brand from everything you do, takes a great deal of time, consistent effort (ask Tracy Meyers if it happened overnight), and a ton of energy. Hopefully, by going through this process (and practicing) you will not only have a better understanding of your own tastes, but will begin to understand all of the dimensions of a strong brand. Continue updating your hall of fame. Who knows, maybe next year you will be the one doing a brand presentation. Print article This entry was posted by Bill Playford on November 2, 2011 at 12:15 pm, and is filed under Uncategorized. Follow any responses to this post through RSS 2.0. You can leave a response or trackback from your own site.